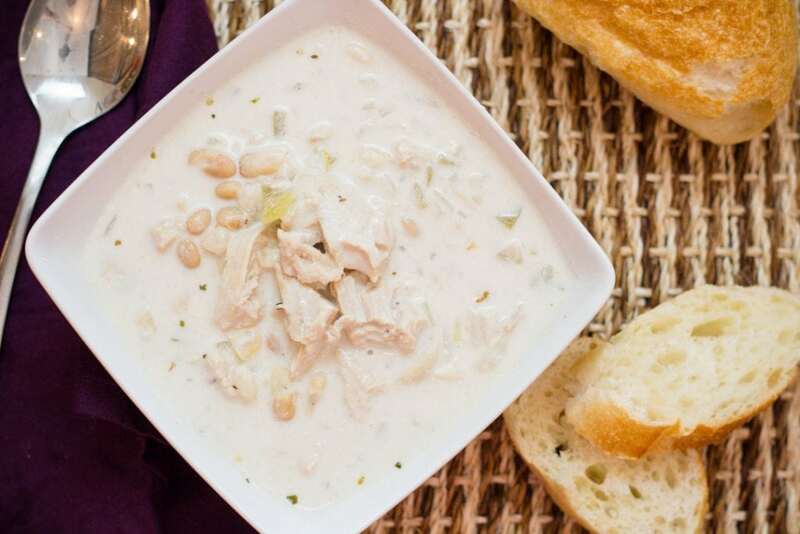 White Chicken Chili Recipe is a creamy Chicken Chili with Great Northern White Beans. Add more or less heat to this Chili Recipe and serve with warm toasted french bread. 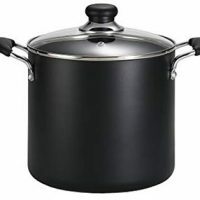 Recently I was served this recipe from a friend and loved it as we talked I thought it would be fun to convert this recipe for the Pressure Cooker. 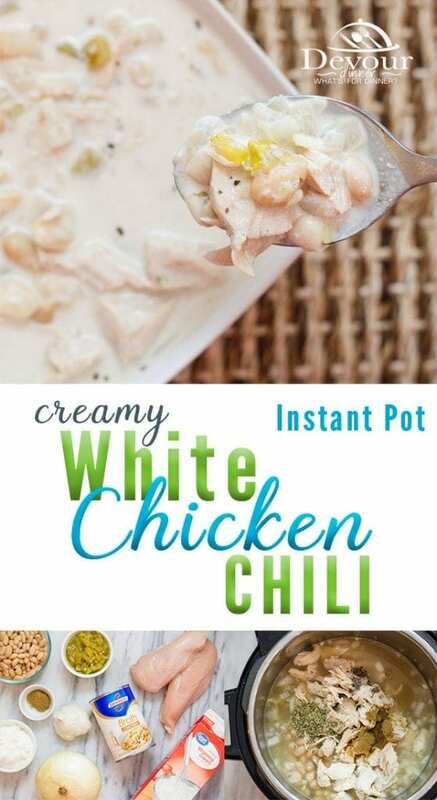 So this recipe for White Chicken Chili is adapted from her recipe. 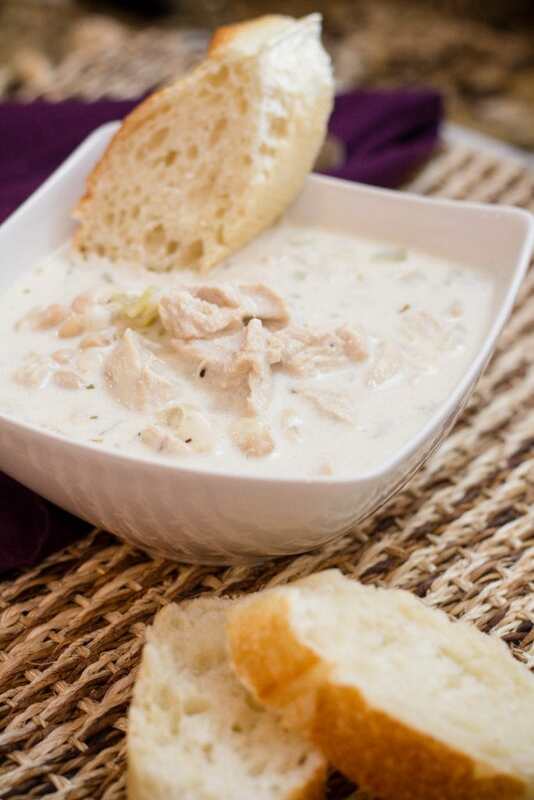 There are plenty of White Chicken Chili Recipes, this recipe was given to me and what I loved most about this recipe was that it was hand written on a 3×5 recipe card. I love handwritten recipe cards with the creators own handwriting and extra notes to make it extra special. In this digital world, there is just some nostalgic about a recipe card. Seeing the notes and directions, and after tasting this recipe, I knew I had to make it. I’ve made a few changes in the recipe and adaptions for the Instant Pot, however I’ve also included stove top directions too. 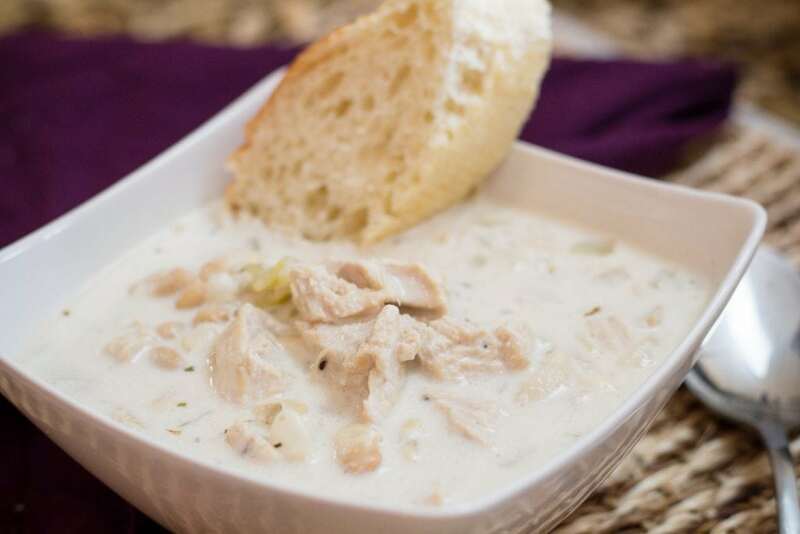 White Chicken Chili will last 3-4 days if kept properly in the refrigerator or you can freeze for up to 3 months. 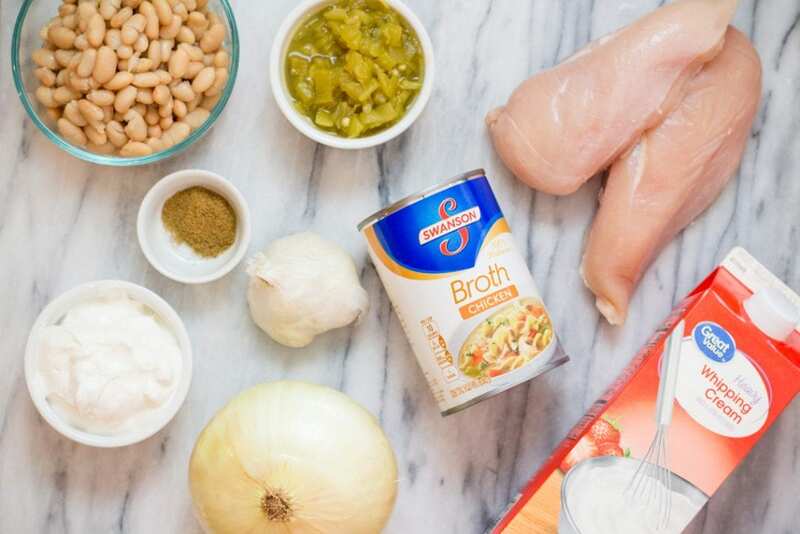 How can I thicken White Chicken Chili? I love to do meal preparations and cook and shred chicken for future meals. Shredded chicken will freeze for a rainy day and make meals so much easier to make on those busy nights. 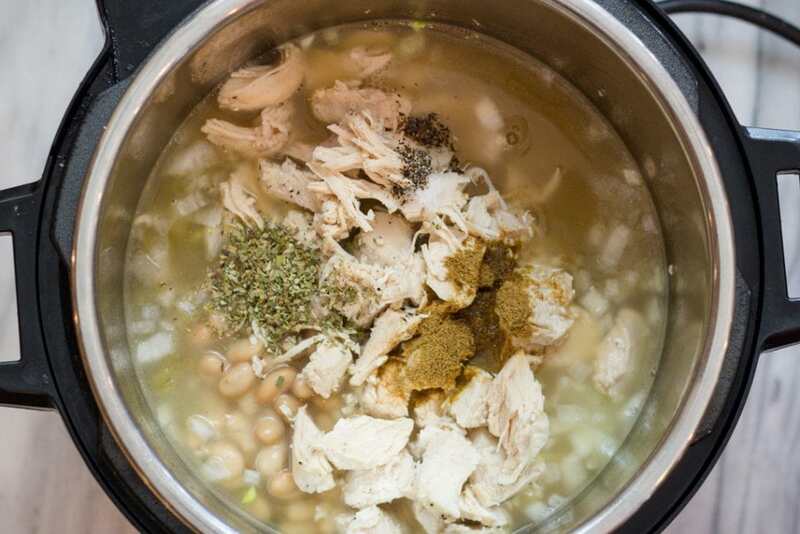 My crock pot recipe for making shredded chicken can be found on my “Chicken Page” at the top. You can also use your pressure cooker to make chicken and shred too. Having bags of shredded chicken become super simple. Trust me! I use shredded chicken in many recipes, one of my favorites is Honey Lime Chicken Enchiladas. YUM! So easy to throw this recipe together if the chicken is all cooked. I promise. Did you know you can substitute cut up rotisserie chicken in place of shredded chicken? You can! 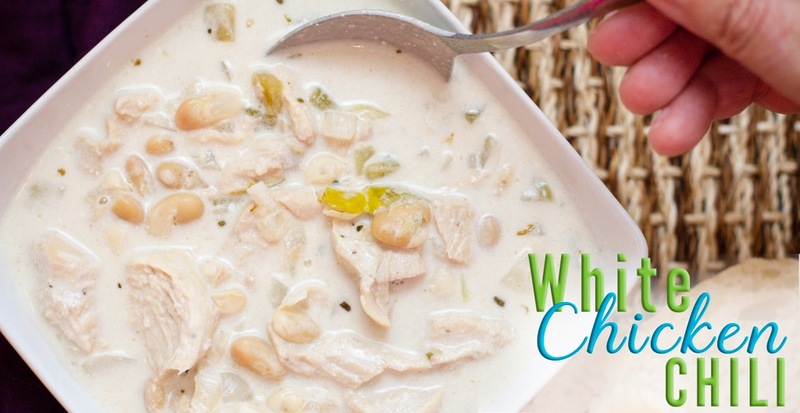 That makes this for White Chicken Chili recipe super simple! Heat a Frying pan and add butter and garlic. 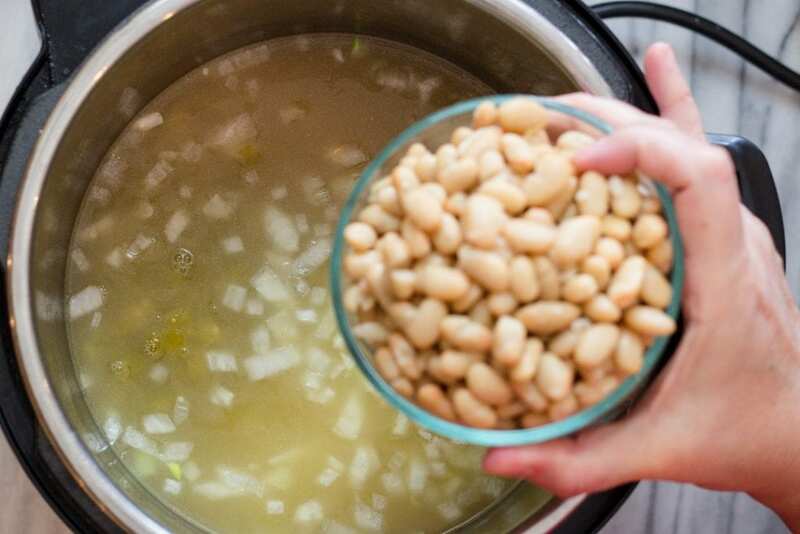 In a large stock pot, add broth, beans, chilies, salt, pepper, cumin, oregano, and cayenne. Simmer covered on medium/low heat for 1 hour allowing flavors to meld together. I love chili especially on cold days I am yet to try a chicken one, this respite looks very easy thank you for sharing this. 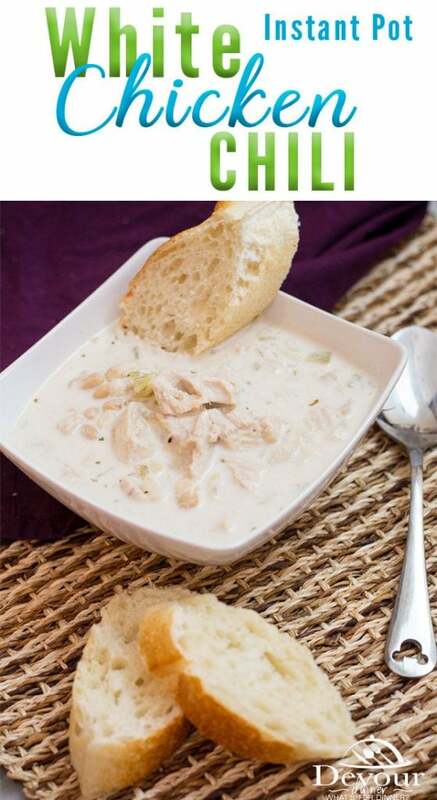 Chicken Chili is super delicious and a whole different flavor than traditional chili. I hope you enjoy it as much as we do! 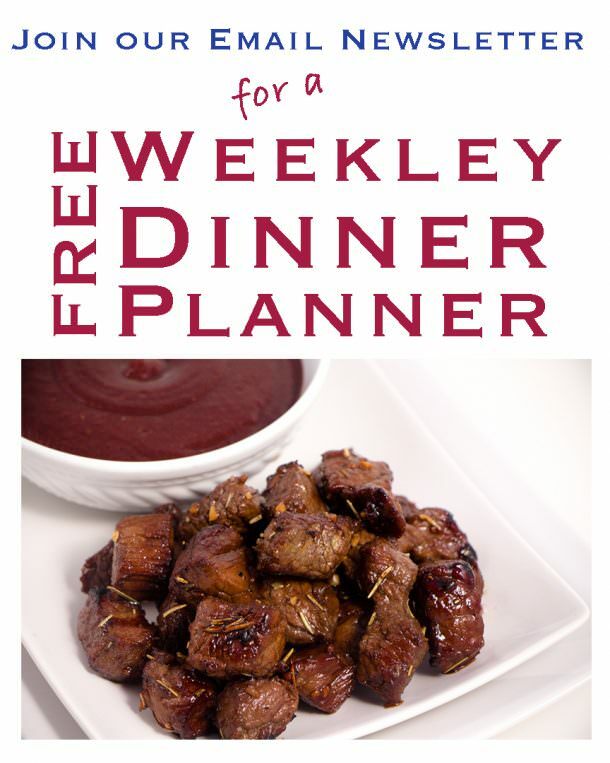 This would be perfect for dinner tonight! It’s cold and dreary here, so I’ll need something to warm everyone up. This looks delicious! Chili is always good to warm people up! And it just tastes great too! I recently made a white chicken chili for my daughter’s birthday, and it did not turn out as good as I had hoped. I’m exciting to use your delicious-looking recipe moving forward! Thanks for sharing! Oh no! I’m sorry our other recipe didn’t turn out. I’ve made this many times and it’s a crowd pleaser! Your photos of chili are amazing. Going to try this this week. This looks really good! I love one pot meals this time of year and chilli is one of my go tos. This is a nice change from a traditional chilli recipe. Is there anything you can recommend as a substitute for the whipping cream? One pot meals are super nice for sure. Hmmm, if you want to substitute the heavy cream, try Evaporated Milk. However it must be added at the end and not before the cooking process. 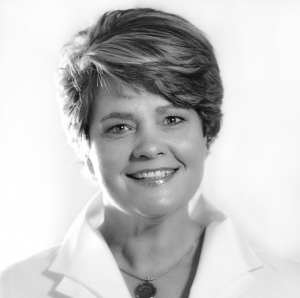 I use Evaporated Milk often to “skinny” up a recipe! I love white chicken chilis and am always looking for different recipes for it. 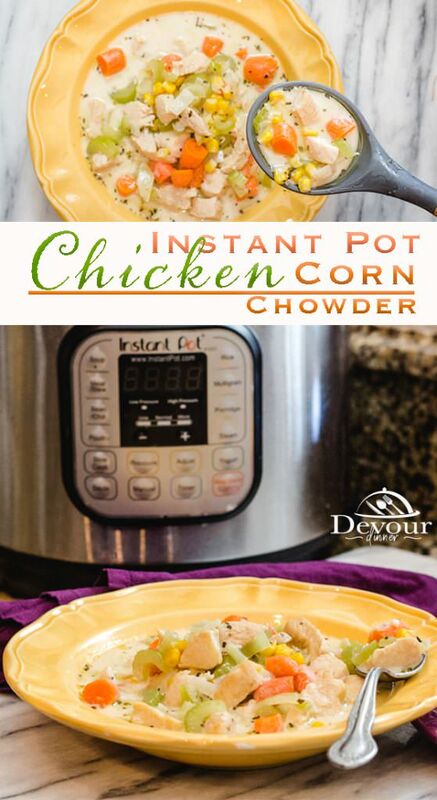 I love that this has instant pot directions. Hi Gemma! I love Chicken Chili too. Hope you will try it. 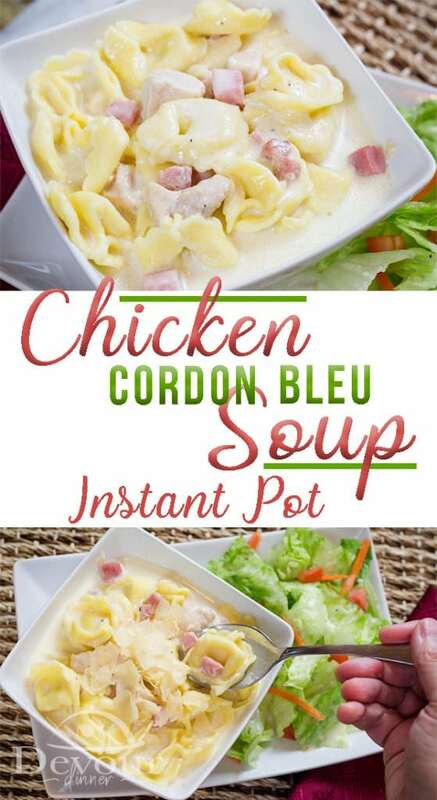 I try to put variations in the recipes so you can cook on the stove or crock pot too! This recipe looks delicious! I love the tip of using rotisserie chicken! This just made it on the menu for dinner tonight! 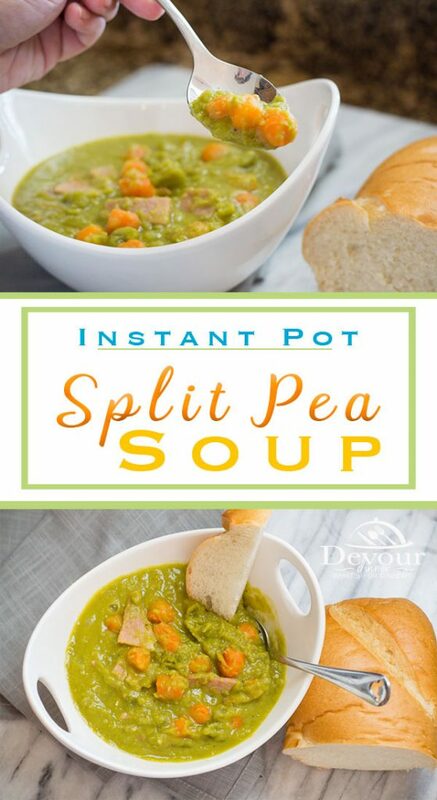 I’ve never tried it in the instant pot so this will be a keeper! Love it! It is a keeper of recipe, I’ve made it for luncheons with my friends and everyone always wants the recipe. I like to serve white chili to change it up and give us something different to enjoy. Yum yum yum!! This looks so delicious. It will be perfect for an upcoming super bowl party. I can’t wait for the Super Bowl! So many great recipes to try for game day!! Fascinating recipe! 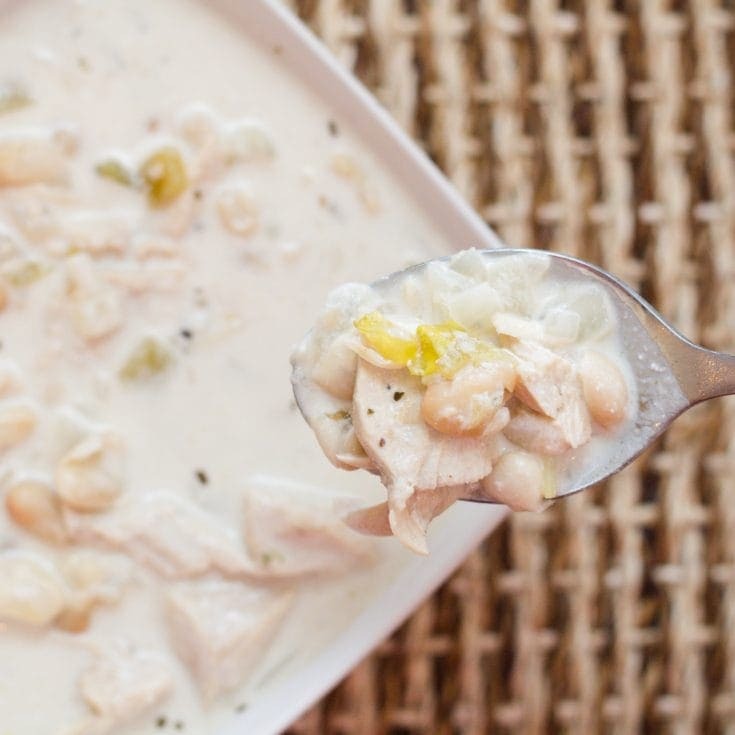 I am a huge fan of white chili and prefer it over red.